About 200 years ago, to save Georgetown College, priests sold human beings thus fully endorsing and profiting from the brutal, dehumanizing institution of slavery. 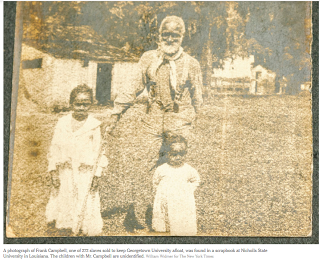 To date, we've learned of the existence of records documenting at least 272 human beings, like Mr. Frank Campbell, who were sold so that that college would survive to become the institution we now call Georgetown University. Evidently, for these priests, the survival of an educational institution outweighed the abuse of the dignity of hundreds of human beings. Today, to gain prominence as an elite university, Georgetown has established financial ties to individuals and governments with social and ideological affinity to racism, sectarianism, and absolutism. Georgetown's connections to Wahhabism and individuals who are interested in whitewashing that sect adds to the University’s legacy of exploitation in pursuit of elitism and financial advantages. Recently, Georgetown’s dark history with slavery was brought to the forefront once again when one of its faculty members used dubious logic and absolutist interpretation of ancient texts to argue that slavery is morally justified in Islam, a position that conforms to that held by groups like ISIL and al-Qaeda. First, there is no absolute evidence that Prophet Muhammad owned slaves. Those who contend that Muhammad had slaves rely on oral reports (written down three centuries removed from the time of Prophet Muhammad) invoked, preserved, and transmitted by figures who owned and even abused slaves themselves. Therefore, to emphatically assert that there is no "denying that Prophet Muhammad had slaves" amounts to suggesting the existence of a fact beyond any reasonable doubt. There is doubt beyond reasonable levels about events that took place more than 1400 years ago, especially when all the textual evidence is derived from only one school of thought: Salafism. Indeed, leaders and wealthy individuals gave Prophet Muhammad slaves as “gifts” but he emancipated them: the women became his wives and the men became his mawāli (i.e. mu`taq [freed], as was the case with Zaid (given to him by the wealthy Khadijah, who married him later). However, many of the aristocracy of Arabia, who were absorbed into the newly established Islamic state, continued to own slaves. Considering that it was this aristocracy that monopolized most leadership positions after the death of Prophet Muhammad, it is easy to figure out why the institution was kept alive and by whom. Second, while the Quran did not explicitly abolish slavery as a matter of law, the text and tone of the Quran left no doubt that enslaving human beings was morally wrong and that emancipating slaves was morally right. Moreover, the Quranic text consistently avoided the use of the word “slaves” [`abīd]. It referred to persons already in servitude as “what your right hands previously possessed” [mā malakat aymānukum] instead. Importantly, this wording, with the verb "possess" or “own” conjugated in the past tense, indicate that such a state of being lacks permanence. In other words, those who were enslaved before the start of Islam will continue to be so, but no new ownership of slaves shall be initiated moving forward. With that being the case, whether Prophet Muhammad had slaves or whether he was “more morally mature” becomes immaterial. The text of the Quran explicitly determined that slavery is immoral and it established a path (atonement and substitute for religious obligations with valid reason) to making it illegal. In fact, most proscribed acts were first judged morally contemptuous before they were explicitly prohibited in the Quran. The gradual prohibition of wine [khamr] is a good illustrative case in point. Seventh, like many other Traditionist Muslims, Brown privileges reports found in Sunni collections of Hadith and Tafsīr. He ignores, or is unaware of the rich body of religious, legal, and political texts produced and preserved by Ibadi and Shia Muslims, which provided fuller narratives and contexts especially regarding the most divisive and controversial events and ideas. The logic Brown employs is common among many Traditionist Muslims (ahl al-ḥadīth), too. For them, it would suffice to point to an event or an act purported to be from the formative period of Islam where lived the Predecessors (salaf) for such an act to be applicable to all human beings and in all times. Their reasoning is simple: If something was practiced or said by the Prophet, his Disciples [ṣaḥāba), or the Predecessors in general, then it is binding—part of the canon. 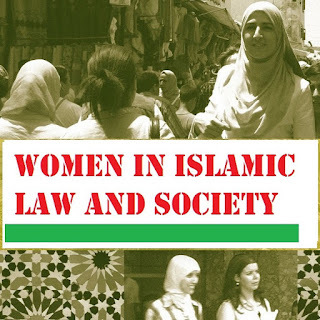 Traditionism, the method of deriving ethical and legal judgments, was foreign to Muslim scholars of the first three centuries of Islam, who were primarily Reasonists (ahl al-ra'y].